The two figures in this work were modeled on members of the Impressionist circle - the artist Marcellin Desboutin, and the actress and model, Ellen Andree - and are shown at the Nouvelle-Athens Cafe, a favorite meeting place at this time. Desboutin was painted by Manet in 1875 and Andree appears in works by both Renoir and Manet. Degas did not finish the work in time for the Second Impressionist Exhibition of 1876, but it appeared at the Third of 1877. Despite its realistic basis, the scene cannot be seen as merely a slice of Impressionist life. It attracted considerable criticism when it was exhibited, especially on its display in London in 1893. On this occasion the conservative English artist Walter Crane claimed it to be 'a study of human degradation, male and female'. What many saw was a depiction of alcoholism, which became a public issue in France during the Second Empire. Right wing politicians had exploited it as a means of explaining away broader social and economic difficulties, while a growing temperance movement had also emerged. 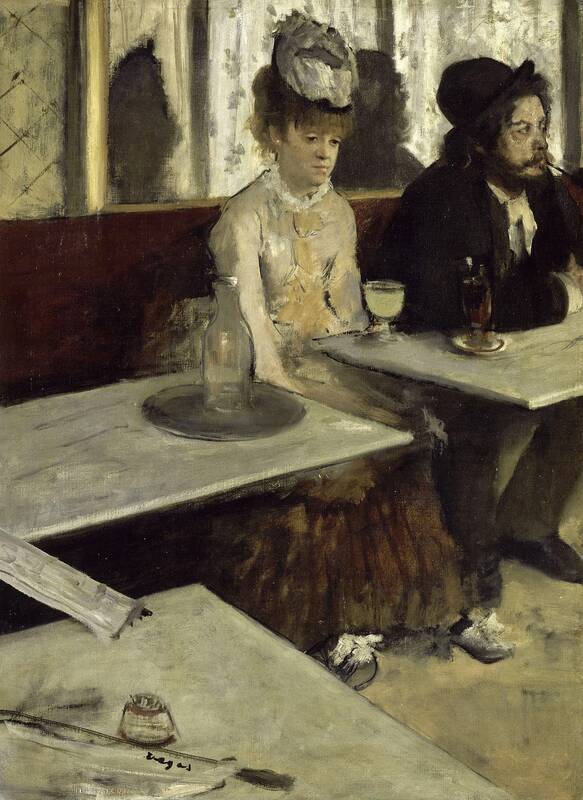 Further evidence of public sensitivity to the subject is indicated by the fact that Manet's much earlier picture of an absinth drinker (1859) was refused by the Salon for its uncompromising naturalism. Absinth (identified as Andree's drink by its colour and the presence of a carafe of water) was the most popular of spirits in France at this time. With the increasing demand for it there arose an almost mythical notion of its addictive, debilitating effects, which are suggested here by the slouching pose and vacant, lifeless expression of the woman. The full shadows behind the figures and the grey palette furthermore indicate that the scene is set in the morning. Typical of Degas' treatment of the subject is his detachment and the way in which the viewer is made to feel uncomfortably close to the figures: the viewpoint seems to be from the adjoining table. The large expanses of bare table top draw the eye swiftly from the cursorily sketched newspapers in the foreground towards the main subject. The artist's objective, pitiless gaze is echoed by the psychological distance between the two figures: no clues are given as to whether there is any relationship between them or whether they are merely seated together.